Due to its magnetic field trapping particles from the Sun, Jupiter is surrounded by very powerful radiation belts which would kill anyone who entered them. Jupiter's moon Europa is thought to have a giant ocean below its surface. 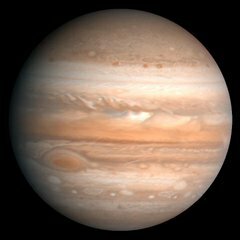 Jupiter is by far the largest planet within our Solar System: two and a half times larger than all of the other planets put together. It is the fifth planet from the Sun and one of the brightest planets. Jupiter is sometimes called a "gas giant" because most of this planet is made up of liquid and gas. 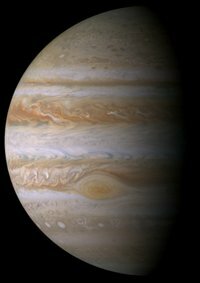 Jupiter is 142,984 km or about 11 Earths in diameter at the equator. That makes it about one tenth as big as the Sun! 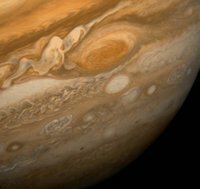 About 1,400 Earths could fit into the volume of Jupiter. It is 133,709 km or 10 Earths in diameter from pole to pole. Jupiter's rapid rotation makes it bulge out at the equator. The surface we see is not solid. This enormous planet has a relatively small solid and rocky core. Liquids and gases surround this core and blend with the atmosphere. Jupiter is a cloudy, windy and stormy planet. It is always covered by a layer of clouds, and wind speeds of 600 km/h are not uncommon. The storms are visible as swirls, bands and spots. A particularly violent storm, about three times Earth's diameter, is known as the Great Red Spot. This storm has been in existence for nearly 300 years! The layer of clouds is divided into several bands. The lighter colored bands are called zones and the darker bands are called belts. The colors are caused by small changes in the temperature and chemistry. Each band rotates in the opposite direction from its neighbors. Along the edges where the bands meet, these winds collide and create swirling patterns. The stormy atmosphere of Jupiter has flashes of lightning just like on Earth. However these can be up to 100 times more powerful. The lightning is made by water near the tops of the clouds. 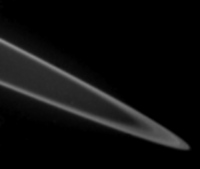 Jupiter's rings are dark and hard to see. They are made of tiny particles that meteors knocked off Jupiter's small inner moons and debris left over from comets and other objects that came close to the surface of Jupiter. In fact, until the Voyager spacecraft arrived near Jupiter and took closeup pictures of the rings of Jupiter, scientists didn't even know that it even had rings at all. Two rings are clearly from material that can be associated with two sets of the inner moons of the planet. Jupiter has 63 known moons. There are four major moons that were discovered by Galileo in 1610. Those moons are Io, Europa, Ganymede and Callisto. They are called the Galilean moons. There are often eclipses on Jupiter's cloud tops by the Galilean moons. There are four small moons orbiting inside Io's orbit. That group is called the Amalthea group because Amalthea is the largest one. They are all small and potato shaped. Amalthea is very red. The material of Jupiter's rings came from meteors knocking it off of those moons. Io is Jupiter's closest major moon. It is 3643.2 km across, slightly larger than Earth's Moon. It has volcanoes and molten sulfur lakes. There are not very many craters if there are any at all because the volcanic activity would cover them up. Io has an iron and maybe iron sulfide core at least 1800 km across. It is surrounded by a silicate shell. There is little water on Io. 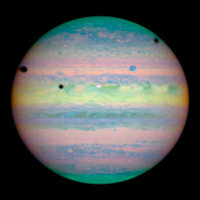 Maybe it was because when Jupiter was forming, it was hot enough to dry out Io, but not the other major moons. In Roman mythology Io was a beautiful young woman that Jupiter loved. Europa is 3,121.6 km across, about ten percent smaller than Earth's Moon. It is made of silicates and has a layer of smooth water ice 10 to 30 km thick. The ice has long cracks in it and very few craters. It looks like the sea ice on Earth. The ice had slid around at the cracks. There is liquid water under the ice up to 100 km below the surface. There are also some large spots on the surface. In Roman mythology Europa was courted by Jupiter in the form of a bull. Jupiter as seen by the space probe "Cassini". This is the most detailed color portrait of Jupiter ever assembled. Ganymede is 5262.4 km across, making it 380 km bigger than Mercury. It is Jupiter's largest moon and the largest moon in the Solar System. It had plate tectonics like Earth. There are older darker regions and newer areas with grooves where the plates moved. Newer craters have bright rays around them from material thrown up by impacts. Older craters look flat and faded because the icy surface does not hold the shape of the crater as well as rock does over long periods of time. Ganymede may have an iron and sulfur core with a silicate mantle and an icy shell. It may be like an Io with a layer of ice on it. In Roman mythology Ganymede was a beautiful young man who Jupiter kidnapped and made cupbearer to the gods on Mt. Olympus. Callisto is 4820.6 km across, about the same size as Mercury. It has many craters. Like craters on Ganymede, the older craters had faded. The largest crater is Valhalla. It has a bright center 600 km across with rings around it up to 3000 km across. Callisto is made of silicates and ice. There is a 200 km thick icy crust with a liquid water sea under it. In Roman mythology Callisto was turned into a bear by Jupiter's jealous wife Juno. Later Jupiter placed her in the stars as The Great Bear. The other moons are tiny ones in several groups outside the orbits of the major moons, there is a small moon, Themisto and four groups of little moons that orbit very far from Jupiter. One Jupiter day is about 10 Earth hours long. You have to say "about" because different parts of Jupiter rotate about its axis at different speeds. This is caused by the fact that Jupiter is mostly gases that are in constant motion and sometimes going in opposite directions. Some efforts have been made to try and measure the rotation speed of the inner rocky core of Jupiter, but that has proved to be quite difficult to accomplish due to the magnetic fields that surround Jupiter and the very active radio energy that is generated by the atmosphere of Jupiter, which interferes with measuring techniques like radar that has been used to measure the surface of Venus and Mars. One year on Jupiter is 4,335 Earth days or 11.87 Earth years long. A Jupiter year is about equal to four-tenths (or two-fifths) of a Saturn year. Thus after every two Saturn years, Jupiter has completed five full orbits about the Sun. So after 59 years, Saturn and Jupiter will be back in nearly the same position. When the orbits of two planets are simple ratios of each other like this, it is called a resonance. If you were floating close to the cloud tops of Jupiter, it would pull you down with a force about two and a half times as strong as the force of Earth's gravity. Jupiter's rapid rotation causes the equator to bulge out. This would also cancel out about 10 percent of gravity's force on you if you were at the equator. The amount of this counteraction becomes lower the closer you get to the poles. Jupiter is named after the chief of the Roman gods, also called Zeus in ancient Greece. It was so named because of the planet's enormous size, which dominates all the others. 3. Who is Jupiter named after? b) The planet Jupiter is named after the God of War. d) Jupiter is named after the Roman god of agriculture. c) Jupiter's rapid rotation causes the equator to bulge out. b) liquids and gases surround Jupiter's core and blend with the atmosphere.